Jesse Charbonier has been performing regularly at Chicago’s iconic Drake Hotel in its legendary Coq d’ Or Lounge to rave reviews since the summer of 2011. Performing with Adrian Ruiz on Piano and Michael Lough on bass, they perform many selections of the American Song Book, especially those made famous by such iconic vocalists as Billie Holiday, Nat King Cole, and Chet Baker. Charbonier released his first album on December 15, 2013 titled, “Jesse Charbonier; Live at the Vic Theatre – Chicago,” What was a performance he was hired for, was considered so exceptional that it evolved into a live album release. Featuring Adrian Ruiz on piano, Nils Higdon on drums, Patrick Mulkahy on bass and Shaun Johnson on trumpet, the sound captured in the live album is a sound that takes one back to a time when true musicianship was not only performed, but was cinematic in its delivery. Jesse Charbonier was born in Chicago. He always had a love for the arts and began acting, singing, and songwriting at an early age, but became more involved as a more behind-the-scenes player—marketing, directing, producing, films and music artists. As a result, Charbonier truly understands and values all of the elements that come together to create a moving event, film or musical performance. In music, Charbonier has developed and produced music and music videos for artists from various genres. In cinema, his involvement varies, from the full-scale production of independent feature films, to programming and organizing film festivals all over the United States. Years ago two films had a profound effect on Charbonier; the documentary film “Let’s Get Lost” directed by Bruce Weber featuring the life of Chet Baker, and “Lady Sings The Blues” directed by Sidney J. Furie, about the life of Billie Holiday starring Diana Ross. He credits these two films for introducing him to the music of Jazz. Although he was raised on Latin and R&B music and still has a fondness for them, those two films led to his exploration of other great Jazz artists and composers. It was then that his love affair for the great jazz songs and vocalists began. 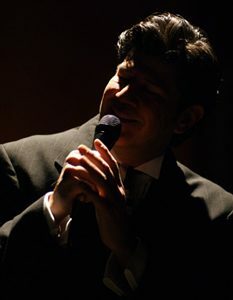 In the winter of 2011 Charbonier came to terms with his love of jazz music and finally decided to pursue his true love of singing passionately as well as professionally. His first recording “Let’s Not Discuss It” is an exquisite composition by Federico D’Antoni. Charbonier wrote its haunting lyrics to accompany the lush arrangements by Arturo Solar. The recording came all together under the guidance of Hollywood producer Juan Manzur. Let’s Not Discuss it is a production motivated by the love that they each have for the musicianship that jazz allows them to demonstrate. Because Charbonier has a filmmaking background, it was important that the accompanying video for the song have a cinematic element to it. Again it was a way to honor the popular “film noir” style of the time of the height of the jazz vocalist. The video, produced by Charbonier, was directed by multi-award winning film maker Tadeo Garcia and multi-Emmy award winner Mario Carrasco. Jesse Charbonier has only just started down a path of artistic fulfillment. It is a path that has been paved by determination and a true passion for the arts, culture and entertainment, as well as the joy and enrichment it brings others.